Michelin Star chef Vineet Bhatia’s Rasoi is once again rated the best London restaurant in the Indian cuisine category, according to Harden’s London Restaurants list for 2009. The best London restaurant rating goes to Petrus, the restaurant of top chef Marcus Wareing, who has two Michelin Stars. The best known chef of Britain Gordon Ramsay’s eponymous restaurant slips from the first place after eight years and is rated second best. Ramsay holds three Michelins. Le Gavroche in Mayfair comes third. Harden’s rankings are based on a total of 85,000 reports from 8,000 diners. The Harden’s guide says average cost of dinner for one in London – including house wine, coffee and service – was now an average 40.11 pounds, with prices increasing 4.7 percent over the last 12 months. 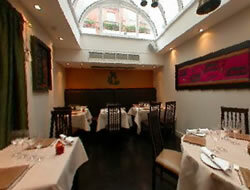 Harden’s described Rasoi as follows in the 2008 ratings list: Sublime and zingy spicing creates “1001 intoxicating flavours” for visitors to Vineet Bhatia’s “tucked-away” Chelsea townhouse – a “bizarre” home for such a pre-eminent “nouvelle-Indian”; prices are “sky high, though”. Mumbai-born Vineet Bhatia earned his Michelin Star in 2001. He worked two prominent London Indian restaurants before setting up Rasoi in 2004, which won a Michelin two years later. He launched Urban Turban – a casual dining affair – in 2007. Among other results, Chez Bruce is named London’s favourite restaurant for the fourth straight year. The Wolseley is again No. 1 for business, followed by the Don and Bleeding Heart. La Poule au Pot is best for romance for the 13th consecutive year. The survey divides restaurants into price categories, with the Ritz Restaurant and Pied a Terre coming fourth and fifth, overall, for places where a meal costs more than 80 pounds ($147). The Ledbury beat J. Sheekey in the 60-79 pounds group; Chez Bruce and La Trompette headed 45-59 pounds; Lamberts and Upstairs Bar were top two in the 35-44 pounds category. Best restaurants by cuisine, reported by Bloomberg, are British: Chez Bruce, Lamberts; French: Petrus, Upstairs Bar; Italian/Mediterranean: Assaggi, Latium; Indian: Rasoi Vineet Bhatia, New Tayyabs (Pakistani); Chinese: Kai Mayfair, Mandarin Kitchen; Japanese: Zuma, Jin Kichi. India don’t like being favourites, and being written off by many even before their young ODI side assembled in Colombo ultimately worked just fine. Defeat in the final Test at the P Sara Stadium was so comprehensive that it was difficult to see where the one-day recruits would turn for solace as they landed for five matches against Ajantha Mendis and Co. Now, after beating the hosts by 46 runs, India have sealed their first series win in Sri Lanka. And central to their success has been their captain, Mahendra Singh Dhoni. From the day he landed in Colombo, Dhoni stressed the past should be left alone and the focus should be on the task facing his side. He admitted Ajantha Mendis would be a threat but said it was up to the individual to handle him. He stressed on the importance of the batsmen to back themselves to score briskly, despite the setbacks. India’s recent record in the subcontinent included losses in the finals of the Kitply and Asia Cup, which Dhoni termed as “crucial games”, and he hoped to rectify that trend. This match was a final in itself, and India held their nerve to win it. He is a very important cog in this wheel, and for the second game running he was at the centre for India, overcoming health issues – he had a a fever yesterday and evidently hadn’t recovered fully. Dhoni and Suresh Raina showed how it should be done, scoring runs at a good clip after Sri Lanka left India 81 for 3 in the 18th over. He led the way in proving Mendis could be thwarted, even as he struggled to remain on his feet towards the end of his innings. Overall, Dhoni has top scored in the series with 192 runs at a strike-rate of 79.33, won four tosses in a row, made the right selection choices, and been proactive in the field. Under lights, with Sanath Jayasuriya in a punishing mood, Dhoni tossed the ball to Harbhajan Singh in the 18th over. With pace taken off the ball, Jayasuriya edged the third ball to a smartly-placed wide slip. After that Dhoni added an extra cover, who was sharp to deny runs. Attempting to work Yuvraj Singh off his pads, Chamara Kapugedera was trapped lbw. These are minor moves Dhoni makes, but they often have a resounding resonance. Dhoni opted for four specialist bowlers in the last two games and he was rewarded with wickets from Yuvraj. Dhoni also won four successive tosses: some call that luck; with Dhoni, it’s all part of the package. In his book, What Sport Tells Us About Life, Ed Smith writes of the 19th-century historian Thomas Carlyle, who believed the bravery of heroes and leaders derived from their inspired and resourceful force. “The history of the world,” Carlyle argued, “is but the biography of great men.” Dhoni is no great, yet, but he has this amazing knack to inspire. And, since becoming captain and changing his approach to batting, he has played key roles with the bat. He averages 57.17 when in charge, with ten fifties and one century. Many had criticised Dhoni’s decision to skip the Test series, forgetting that he had to endure such a gruelling schedule this last 18 months (14 Tests, 56 ODIs, eight Twenty20 internationals, and the IPL). In the Test side Dhoni has yet to cement his place, as one century in 31 matches suggests; in fact, he was dispensable at the time he announced he was opting out. Dhoni is the most important member of a young one-day side and he realised that for the better. Numerous television chat shows slammed Dhoni for the loss in the series opener and for reportedly influencing the selectors to pick young talent instead of ageing, vastly experienced heroes. Now Dhoni has led this group, with their struggles and pressures, to win a series few expected them to even contest. Consecutive fifties from Raina and Dhoni, Virat Kohli’s maiden half-century to papered over the failures of Gautam Gambhir and Yuvraj, Munaf’s two-wicket burst, Zaheer Khan’s accuracy, wickets for the spinners. This match had it all, and that will give Dhoni immense satisfaction. Critics can argue that India were helped by a complete batting failure by the hosts, and off-key series for Chaminda Vaas and Muralitharan. Dhoni will tell you that his bowlers got the measure of the batsmen, and there is no denying how Dhoni and S Badrinath’s approach towards the spinners in game two sparked a revival. Sri Lanka were poor in this series, very poor, but India were good. This isn’t in the same league as the ICC World Twenty20 or the CB Series, but it should be toasted. It came after Mendis – he who mauled India in the Asia Cup final – and Muttiah Muralitharan made a mockery of the best middle order in Test cricket. The line-up India fielded resembled virtually that of the dismal Asia Cup final but, led by Dhoni and his sheer bullishness in believing Mendis could be overridden, they overcame the odds. Ignore the awful times, and concentrate on the good ones, seems to be Dhoni’s mantra. Baseball, poets say, cannot be scripted. Neither can cricket. After the barrage of questions they faced before this series, Dhoni and his bunch of upstarts can sit back and smile. They’ve defied the odds and deserved to win, and Carlyle would certainly have toasted their success. 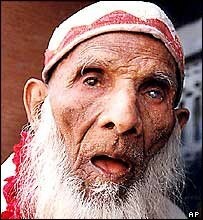 Habib Miyan, who was born around the same time as Mahatma Gandhi and had been blind for 60 of India’s 61 years of Independence, died this morning. He was 138. Frail but spirited, India’s oldest man who went on Haj just three years ago and had a hip replacement surgery last year appeared to know his time had come. Yesterday, the centenarian called Rajesh Nagpal, the bank clerk who had made him famous, over to the house where six generations of his family lived and told him softly: “I am going to go now.” He died at 3am. He was suffering from diarrhoea and had been throwing up. Nagpal was posted in State Bank of India’s Transport Nagar branch in Jaipur in 1998 when he noticed the old man who would come to collect his pension. He dug out the dusty pension order that showed Habib Miyan had long turned 100. He had started drawing a pension of Rs 1.46 on June 1, 1938, when he retired as a clarinet player in the maharaja’s band. In 70 years, that rose to a princely sum of Rs 2,698. The chance discovery changed Habib Miyan’s life. The Limca Book of Records recognised him as the country’s oldest man and the media couldn’t have enough of him. The SBI certifies him as 138 years old, giving his birthday as May 20, 1870 — Vladimir Lenin was born a month earlier, in April 1870. But his family claims Habib Miyan was born Rahim Khan, son of Kallu Khan, in 1869 — the year of Gandhi’s birth. “If you treat your body well, the body will treat you well,” Habib Miyan would tell anyone who asked him the secret of his long life, great nephew Mehmood Khan, 54, recalled today. Jaipur celebrated his birthday on May 20 every year since Nagpal found him. Except this year. Shaken by the May 13 blasts that killed 68 people, Habib Miyan decided there would be no party. He would spend most of his time in his decrepit house, praying and telling stories to his family of 26 great nephews, their wives, children and grandchildren, who all lived under one roof. The stories would be of Maharaja Ram Singh II, who was on the throne when Habib Miyan was born and whose 45-year rule is called the Golden Age of Jaipur. The children and grandchildren of his brothers had been his family, after his wife Saida and their four sons died 70-odd years ago. Sometime in his late teens, Habib Miyan’s elder brother helped him get a job in the Jaipur State Band, where he played the clarinet for nearly four decades. His dream to go on Haj was fulfilled when two benefactors from Britain sent him Rs 300,000. Three years ago, Habib Miyan became a Haji. Last September, Habib Miyan slipped and fell in the bathroom and had to undergo hip replacement surgery. Dr R.K. Varma, who operated on him, said he was surprised by the number of calls he received from Muslims and Hindus asking about the man who was also called Aabe-e-Jaipur (Jaipur’s lustre). A large number turned up at the funeral today. Reliance Retail has entered into an exclusive pan India franchise arrangement with the UK-based Hamleys, the world’s most famous toy retailer, to bring the latter’s toys to India. This arrangement is aimed at combining the distribution dominance and scale of Reliance Retail in FMCG, food, electronics, consumer durables, apparel, footwear, lifestyle and home improvement categories, and Hamleys’ world-class toy retailing experience, said a company release here. Hamleys brings to this partnership its skills and capabilities of creating a store experience, training its staff to deliver this experience, designing stores and developing private label products to complement the brands. Reliance has the reputation of building the network and running its store operations nationwide efficiently. The company is set to open two flagship stores in Mumbai and New Delhi in 2009. This will be followed by a regional expansion, across India, over the next few years. Reliance Retail Ltd, a division of Reliance Industries Ltd, will be the partner in one of the biggest international expansions by the old iconic toy retailer, approaching its 250th anniversary in 2010. Reliance Retail will replicate the magical and experiential elements of Hamleys famous flagship store on London’s Regent Street and will promise the ultimate treat for the entire family. This will be seen with the combination of strengths that both partners bring to the country. The stores will sell a wide range of toys from the much loved brands to more traditional and nostalgic toys, as well as quirky and unusual treasures. These will include Hamleys own brand range, renowned for exceptional quality and play value. Toy demonstrators and magicians will bring the store to life as well as well as a host of events and activities. 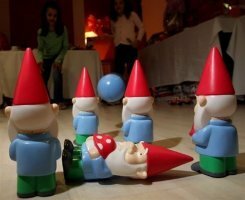 The Indian toys and games market is estimated at approximately Rs 2,500 crore and has been handicapped by lack of significant national brands and the availability of quality retail stores. Being a young nation, there is an opportunity to grow this market by providing a wide range of national and international brands and products under one roof and creating a store experience which is memorable and unique.